SAN ANTONIO — The public will soon know what was uncovered during a special investigation into the CPS Energy nuclear expansion project. Board members decided Monday night to make those results public on Wednesday. They said it is important to rebuild the energy provider’s credibility in ratepayers’ eyes, and the report will help do that. The investigation looked into why city council and the CPS Energy board did not know the cost estimate of two new nuclear reactors had gone up by $4 billion until right before a council vote on it. After Monday night’s meeting, News 4 WOAI asked chairwoman Aurora Geis if she plans to step down, a move Mayor Julian Casto called for. The board also set Jelynne Leblanc Burley’s salary at $300,000 while she is serving as interim General Manager of CPS Energy. As chief administrative officer, she was making $225,000. 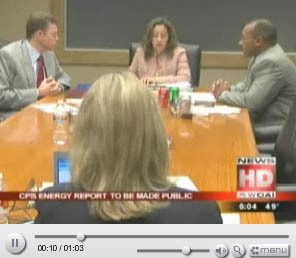 CPS Energy is still searching for a permanent General Manager.